SPW027203 SCOTLAND (1929). 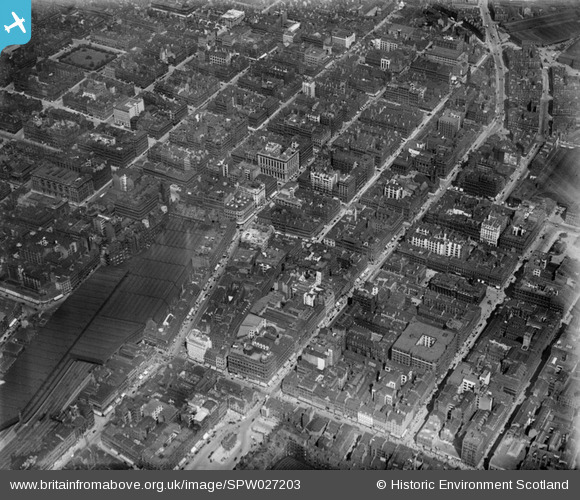 Glasgow, general view, showing Central Station, Blythswood Square and Buchanan Street. An oblique aerial photograph taken facing north. Title [SPW027203] Glasgow, general view, showing Central Station, Blythswood Square and Buchanan Street. An oblique aerial photograph taken facing north. Think this may be The Savoy Theatre. St George's Tron Parish Church. St Vincent St (84-94) Northern Assurance Company's Building. Ca' D'Oro Building, corner of Union Street and Gordon Street. Buchanan St. at Gordon St.
St Enoch Parish Church once stood here. Queen Street Station, Dundas St. entrance. Queen Street looking South to Argyle Street. Queen Street looking North to the British Linen Bank. George Square, North British Station Hotel. Anchor Line Building, St Vincent Place.